Old Lahaina Luau, "The #1 Luau in Maui." Private Oceanfront Village, Arts and Crafts, a Lavish Buffet Dinner, Open Bar (Free) & the Island’s only Traditional Hawaiian Hula Show. Sells-out nightly. Click to book your luau now! No Pre-Payment! Plan weeks or months ahead for best reserved seats. 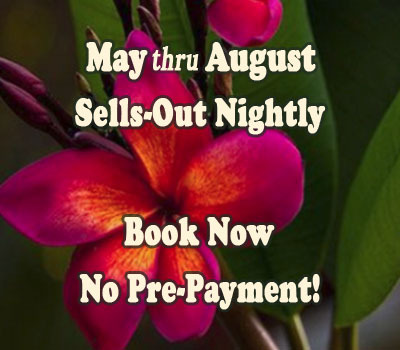 The Old Lahaina Luau sells-out early, so confirm your evening of Aloha now! 100% Best Price Guarantee! 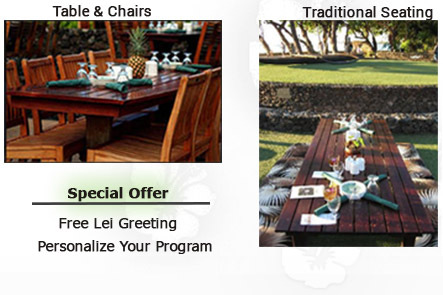 Confirm your Old Lahaina Luau today and each member of your party will receive a FREE Orchid Lei Greeting upon arrival. Plus, personalize your souvenir program at check-out with a special Maui comment. While promotion lasts. Two unique styles of seating offer the perfect viewing experience. Front Row “Traditional,” Low Tables & Mat Seats or “Conventional” Table & Chairs, in a tiered, theatre-style arrangement. Your Hawaiian Luau Dinner is a rich exhibit of regional and traditional food, sure to satisfy every craving. An Open Premium Bar (FREE) is available during the entire evening for your enjoyment. Check this section for many Frequently Asked Questions and more valuable info: Old Lahaina Luau reviews, discount tickets, coupons, seating, rehearsal dinners, parking and more.